This novel CFE gun employs a Hitachi patented "Mild flashing" technique and a new vacuum system which greatly minimizes gas molecule deposition on the emitter tip. The emitter always operates in a "clean" state, and emission current and beam stability are significantly improved. 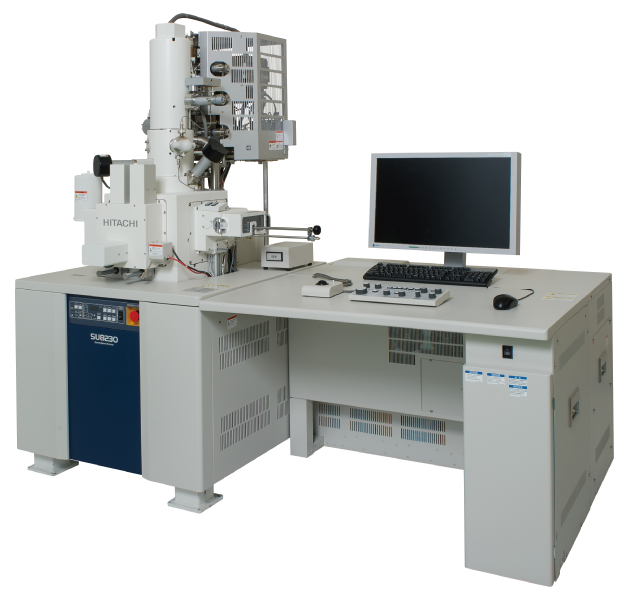 The result is the ultimate SEM electron source offering high S/N, stability, and uncompromising resolution performance at low acceleration voltages. Further, these enhanced performance capabilities open a new gateway for low voltage elemental microanalysis. SU8200 system features include a new top detector filtering system for enhanced electron detection specificity. Fine contrast differentiation is now achieved by selectively filtering inelastic scattering electrons and directly detecting specific energy back scattered electrons. This selective filtering is particularly powerful for enhancing material contrast at low acceleration voltages. Vibration control measures for the stage and chamber, and optimization of the optical system contribute to the high resolution system performance of 0.8 nm at 15 kV and 1.1 nm at 1 kV.